It seems appropriate to start this with story time. 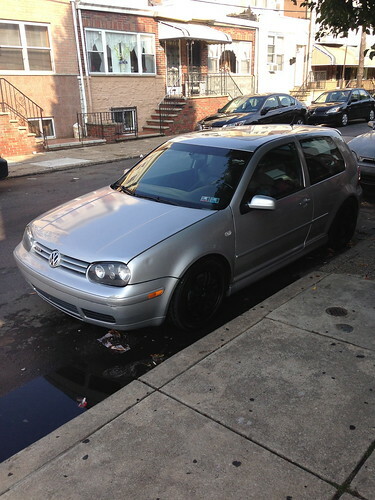 Once upon a time, I owned a MK4 R32. 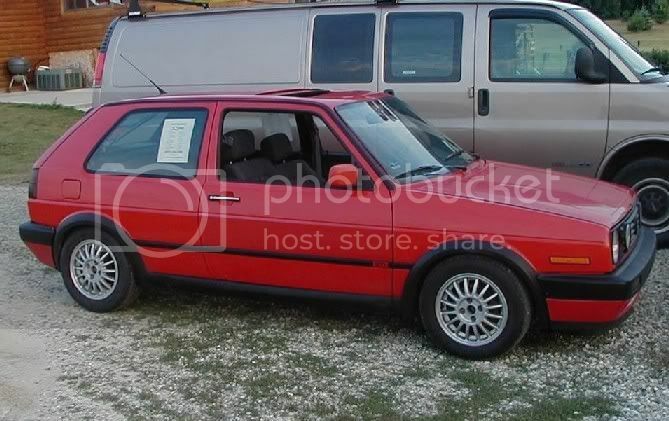 It was a very nice car, my first nice car, and I treated it as such (except for that time I lowered it on v-maxx coils). I sold it last April to a forum member, bilagain, because I thought I wanted something different. 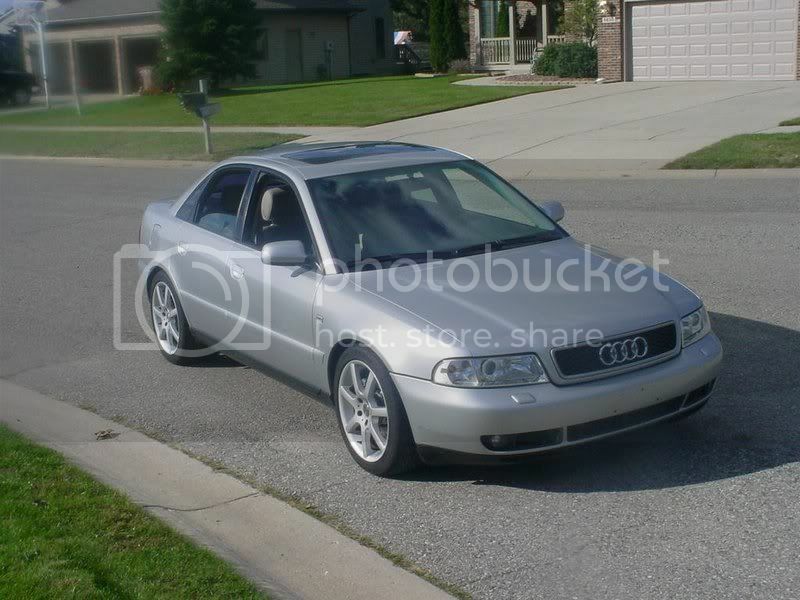 I bought a B6 A4 from a friend and drove that for a while, then my situation changed and I became able to lease new cars for a (very) reasonable price. The problem with these leases is that they are short term, so I don't get to waste money on them with modifications. I've thought for a while that I needed a project, but I never knew exactly what I wanted. I thought about Porsche 944s and MK3s and MK1s but nothing I could find really got my wheels turning. As luck would have it, I happened to be browsing the vortex classifieds one day and stumbled upon the perfect project, another 2004 R32. It spent the first part of its life in Texas, where in 2009 it was in a front end accident that caused it to be totaled. A year later it was re-registered with a rebuilt title and shortly thereafter made its way to Pennsylvania. 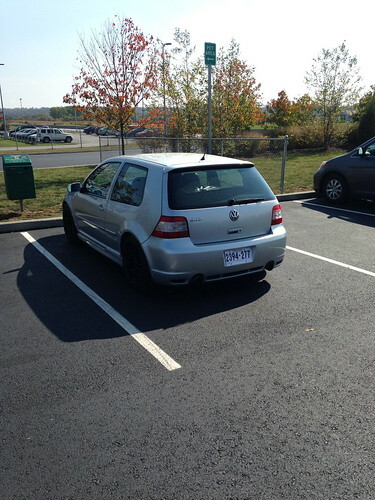 The most recent owner was selling it because he lives in Philadelphia and will be doing a lot of commuting, and R32s aren't really great at that. After a few sleepless nights plotting out my plans and convincing myself and my wife this was not a terrible idea, I flew to Philadelphia and drove it back. It made all 600 miles back without the slightest hitch. Here's the first picture I took of it coolin' on the corner in Philly. As you can see, there are some problems, but the price I paid was reflective of that. The good thing about it, and why it is a perfect project car, is that I will not feel bad about bastardizing it. My original thoughts were that I would make it a race car, cage and all, but now I'm not really sure what I am going to do. Fortunately I have the aforementioned lease car to daily while I do whatever I want with this thing. Came with two sets of headlights, but both are reflectors style with cloudy plastic lenses, not what I am used to. Whatever I decide to do with it as projects go, I want to be sure it can make it to Wookies in the Woods next April. I took my lease Golf R this year and it was awesome, I can't wait to make a run in a real wookie. Updates to follow as they occur. Should make for a fun project car. Thanks for the write up. Boy, the names are a real pain aren't they! Can't wait to see what you do with it! There are no codes because it's got a United Motorsports tune to go along with the E85. It's terrifying on one hand to know that things are being ignored by the ECM, but it runs better than I remember my first one running on cold start so that assuages some of my fears. The week I got it, I added a roof rack, which doesn't go along with my goals at all. Today, I put a set of aristos on it for the winter, but I couldn't leave them silver. That said, I couldn't pick one color, so I decided to split it up. 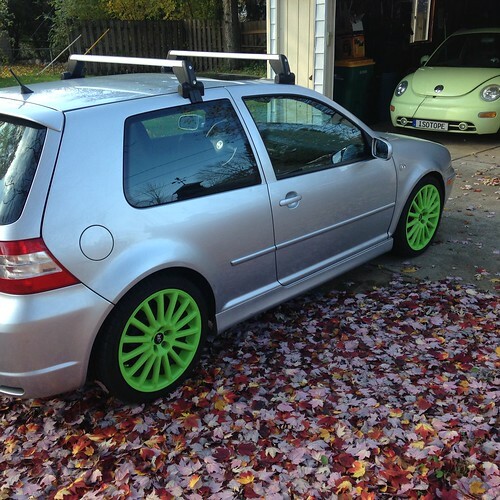 If I can pick a color, the RPF1s might get new paint when they get new tires for the spring. I've got a set of headlights ready to go on, they're just waiting for me to pick up. At some point this winter I will tear the front end off to see if I can make it look less broken. I also need to find new fenders and a new hood and figure out what I'm going to do with the bumper. there's some stampings inside the bumper that ID the bumper material. just make sure what you get works on that kind of plastic. i can check what the part number i got is if you'd like. what does a roof rack with no attachments do? how bad is the bumper? 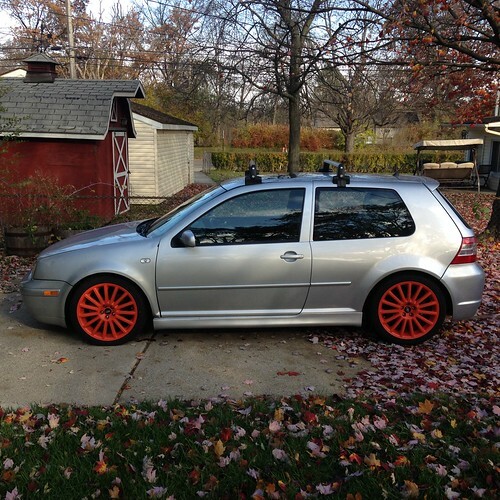 It's just rough in general, and it's a Golf/GTI bumper on an R32. Still undecided, I'll probably paint it with the rest of the car and see what happens. Well, right now it's helping me save space in the garage by holding the new hood I bought. It can also help haul lumber and other things that won't fit in the car (it is a beater, after all). That being said, I bought it partially for the look. I hope that's ok? Add some Christmas lights to them. Is that even legal to do? I got a nice STOCK golf replacement bumper cover without the trim strip for I want to say $95 with shipping?? it fit well and looks nearly identical inside and out to the stock bumper, support pieces and all. if you want, I can go back and find the source and post/send it. because I mentioned it, its 3m #05895 "easy sand flexible parts repair" kit. Thanks, but I'll be going with an R bumper if I replace it and as you said, there are no good R reps.
Forgot to mention in the previous update that I got a new (to me) hood and fenders from ct tdi. Great guy to deal with.